After cleansing, spritz the toner on to a cotton pad and sweep over the whole face and neck area. 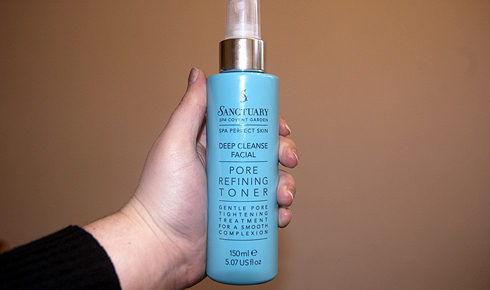 Allow skin to dry for a few seconds and then finish with a Sanctuary moisturiser. Therapist Tip: Close your eyes and spritz directly over the face for a refreshing pick me up any time. Now, as the toner is presented as a spray rather than a product you can just drench a cotton pad in, I found that spritzing the product onto a cotton pad wasn't much use, as the toner dries pretty quickly and more seems to disappear into thin air rather than sitting on the pad. So I tend to skim over the facial directions and just spray onto my face, letting it dry. After application, I feel my skin feels ridiculously fresh and clean, and even after a week of using the product, I have definitely seen improvements in my pores, particularly on my nose. I will most likely be purchasing this product again!